The 17th Century Venetian residence is a true gem located in the province of Treviso, surrounded by the Prosecco vineyards and the Venetian countryside. The high quality services as well as the luxurious timeless room will ensure you an enchanting and memorable holiday. At the heart of the Prosecco wine route, the Relais & Chateaux Villa Abbazia enjoys a relaxing, quiet setting in the picturesque village of Follina. The breath-taking Abbazia di Santa Maria di Follina is only a few minutes away from the hotel. Its beautiful architecture reflects the rich historical and cultural heritage of the country. Enjoy a regenerative walk, a bike ride or even a horse ride and discover the quaint neighbourhood. The restaurant La Corte is the ideal place to enjoy an unforgettable gastronomic experience. 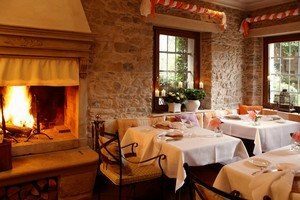 The bistro La Cantinetta serves a wide range of traditional dishes made with local products. Treat yourself with a home-baked pastry and a lovely cup of tea in the Tea Room. Professional masseurs and an outdoor Jacuzzi will guarantee a very relaxing stay. Next to the hotel you will find a gorgeous boutique selling small antique objects as well as replicated objects used in the hotel. A Conference room is available and can accommodate 30 people. Villa Abbazia offers 18 charming rooms decorated in a traditional Venetian style. All the rooms are well-equipped and enjoy a cosy and serene atmosphere. The Comfort Room overlooks the historic centre of the village and its stunning abbey. 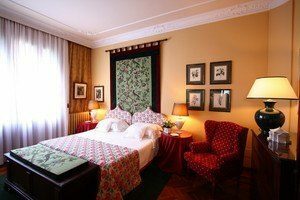 The Deluxe Room as well as the Suites have a lovely view upon the authentic courtyard and peaceful garden of the hotel. The magnificent Presidential Suite has a romantic private terrace overlooking the garden and the Venetian Alps.